Payout percentages at online casinos are usually calculated by independent organisations and two of the major internationally accredited testing agencies which calculate this information at our most highly recommended online casinos include eCOGRA (eCommerce and Online Gaming Regulation and Assurance) and TST (Technical Systems Testing). These two trusted organisations monitor some of the world’s best online casinos and online casino software providers. These two companies, plus one or two other renowned organisations, basically test the games so that you don’t have to. They will then report their findings so that we can see how much a casino has paid back in winnings to its players over a certain period of time (usually one month). This is known as the Return To Player Payout Percentage Information (or RTP % info). This information is likely to fluctuate, but most of our featured online casinos have an average RTP % rate of between 93.00% and 98.00%, sometimes, higher, but usually NEVER lower than this. The RTP % rate is calculated for individual games, but also for certain game categories and for all of the games combined. Let’s just say that the Online Slots RTP % at a casino came to 95.50%. It means that 95.50% of all wagers on the Slot Machines were returned to the players and the remaining 4.5% was kept as profit by the casino. If we look at in in money terms, let’s just say the players wagered a total of $/€/£1,500,000.00 on the slot machines over a monthly period with the same 95.50% RTP % payout rate. This means that $/€/£1,432,500.00 (on average) was returned to the players and the remaining $/€/£67,500 was kept as profit. This is how the casinos can make so much money. The outcomes and results from any online casino game are actually produced by Random Number Generators. RNG’s produce consistently random results which are supposed to be as fair and realistic as can be. TST and eCOGRA test that these RNG’s are always working properly and that they are not faulty in any way. These two auditors will carry out millions of tests and from this information they can calculate the average RTP % info. When you visit any Microgaming powered casino, the latest monthly payout information can be found simply by clicking on the eCOGRA logo which is usually towards the bottom of the homepage. This area will usually display the results for the previous month. 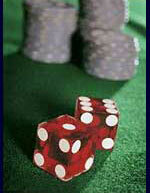 At other casinos, the payout information can sometimes be found when you actually launch a game. For example, when playing on certain slot machines, you can launch the paytable and then when you head towards the back of the paytable, the payout information should be on display somewhere. If you can’t seem to find this information but are keen to find out, the best thing to do would be to contact the casino’s support and request this information directly from the support.